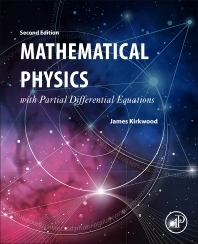 Mathematical Physics with Partial Differential Equations, Second Edition, is designed for upper division undergraduate and beginning graduate students taking mathematical physics taught out by math departments. The new edition is based on the success of the first, with a continuing focus on clear presentation, detailed examples, mathematical rigor and a careful selection of topics. It presents the familiar classical topics and methods of mathematical physics with more extensive coverage of the three most important partial differential equations in the field of mathematical physics—the heat equation, the wave equation and Laplace’s equation. The book presents the most common techniques of solving these equations, and their derivations are developed in detail for a deeper understanding of mathematical applications. Unlike many physics-leaning mathematical physics books on the market, this work is heavily rooted in math, making the book more appealing for students wanting to progress in mathematical physics, with particularly deep coverage of Green’s functions, the Fourier transform, and the Laplace transform. A salient characteristic is the focus on fewer topics but at a far more rigorous level of detail than comparable undergraduate-facing textbooks. The depth of some of these topics, such as the Dirac-delta distribution, is not matched elsewhere. New features in this edition include: novel and illustrative examples from physics including the 1-dimensional quantum mechanical oscillator, the hydrogen atom and the rigid rotor model; chapter-length discussion of relevant functions, including the Hermite polynomials, Legendre polynomials, Laguerre polynomials and Bessel functions; and all-new focus on complex examples only solvable by multiple methods.